Ann Fonck takes it all at the 2018 NRHA European Open Derby finals! For Immediate Release – July 28, 2018 – Kreuth – Multiple past NRHA Open Champion Ann Fonck has been showing in NRHA competition since 2001 when she won her first paycheck worth $276. During her successful career, prior to making her way to Kreuth, her NRHA Lifetime Earnings (LTE) surpassed $871,700. 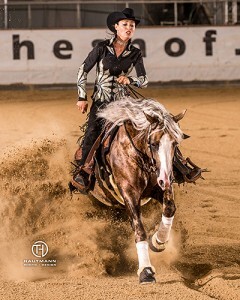 Tonight, the NRHA Professional once again proved her talent in the pen by sweeping the top three spots of the National Reining Horse Association (NRHA) Open Derby. 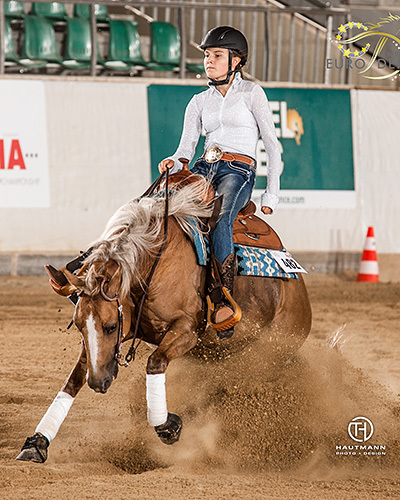 For Immediate Release – July 28, 2018 – Kreuth – A youthful morning made the start of the day special at the 2018 National Reining Horse Association (NRHA) European Affiliate Championship held concurrently with the NRHA European Derby. For Immediate Release – July 27, 2018 – Kreuth – Reiners in Kreuth, Germany, provided exciting competition as they performed vying for the National Reining Horse Association (NRHA) European Affiliate Intermediate Open and Limited Open Championships. NRHA Professional Giovanni Masi de Vargas and Majestic Okie (Okie Dun It Too x Majestic Ice), owned by Katharina Dejori, topped the $4,560-added EA Intermediate Open Championship class. 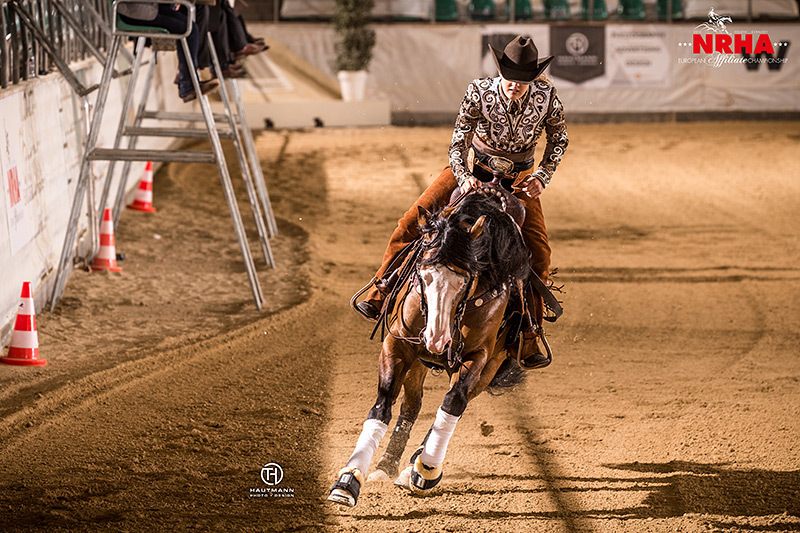 The Italian Professional hit a winning run with the 10-year-old stallion between the reins paid back by the judges with a 220 score. 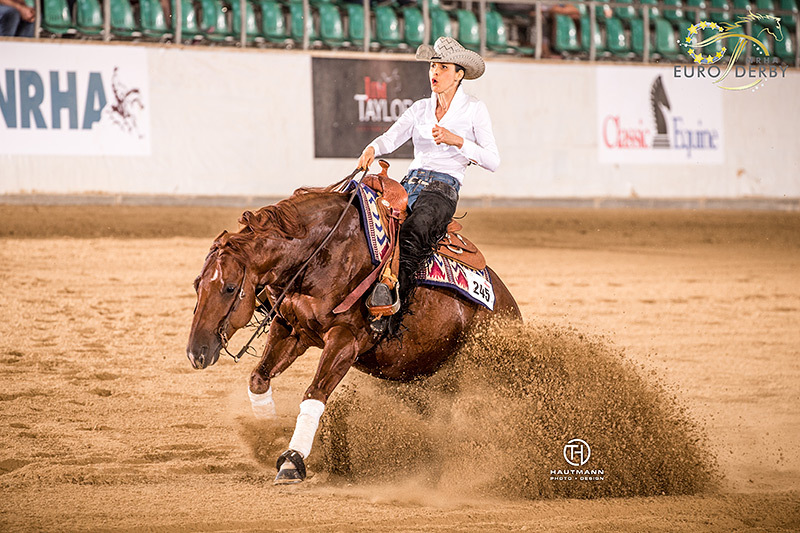 “I’ve been riding this horse since 2014 and he has always been great for me and his owner!” said Masi who boasts multiple FEI and AQHA gold medals. “This is my first Euro Affiliate title and I am thrilled. It’s a great show and achieving this goal has been great, especially considering the fact that the horse owner’s son qualified this horse for the upcoming FEI European Reining Championships for Young Riders.” The champion received a saddle presented by NRHA Corporate Partner Silver Spurs Saddles, an NRHA Lawson trophy, a pair of NRHA Corporate Partner Classic Equine splint boots and an NRHA Corporate Partner Montana Silversmiths buckle. 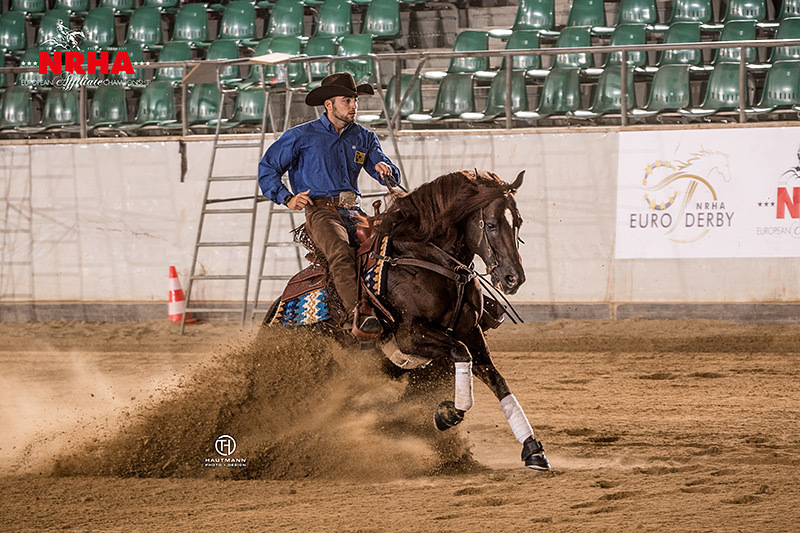 Sicuro also stepped on the highest step of the podium of the NRHA European Affiliate Limited Open class with the 13-year-old American Quarter Horse stallion Iam Sailors Brother (Sir Jac Frost x Sail On Sweetness), owned by Fabio Merola, between the reins. 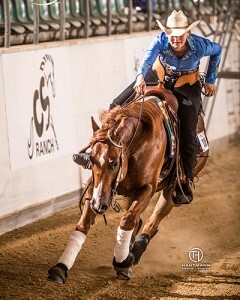 “This horse has left his mark in European arenas more than once and for me to be able to ride him to the championship in Europe’s most prestigious NRHA event is a dream come true,” said the 22-year-old who also received an NRHA Corporate Partner Silver Spurs Saddles saddle, an NRHA Morgan trophy, a pair of NRHA Corporate Partner Classic Equine splint boots and an NRHA Corporate Partner Montana Silversmiths buckle. He also received a pair of bell boots offered by NRHA Corporate Partner Classic Equine, a pair of spurs offered by NRHA Corporate Partner Montana Silversmiths and an NRHA plaque for the Reserve Championship. 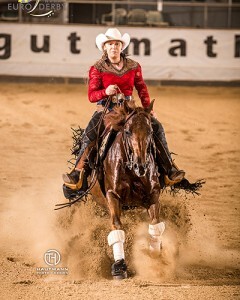 NRHA Professional Barbara Bayer of Austria rode CC Ima Cashgun, a 2011 American Quarter Horse gelding by Gunner out of CC Ima Cash Surprise, owned by Alexandra Widholm, to a 216 score which earned her the reserve championship in the European Affiliate Limited Open Championship. 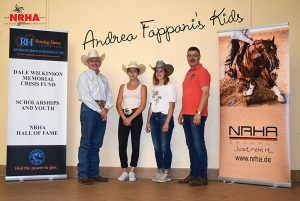 Riders who will be competing in the NRHA European Affiliate Youth Championship 13 & Under and 14-18 had tons of fun this morning during the meeting sponsored by NRHA Germany. Riders representing 14 countries enjoyed their time together and got to know each other better in view of the NRHA European Affiliate Youth Team Tournament. 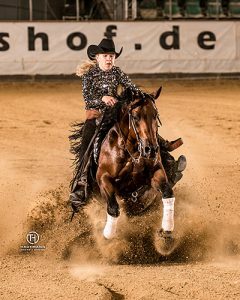 For Immediate Release – July 26, 2018 – Kreuth – The National Reining Horse Association (NRHA) European Affiliate Championship filled the day in Kreuth, Germany, where three 2018 Champions were crowned. The German flag flew high on the second step of the podium as Julie Van Laer and her own Bucks N Jewels (Smart Starbuck x Jewels Freckalena) performed to a 209. 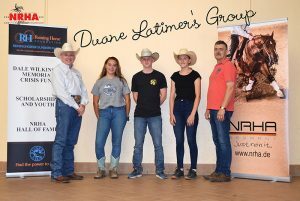 The reserve champions received a pair of bell boots offered by NRHA Corporate Partner Classic Equine, a pair of spurs offered by NRHA Corporate Partner Montana Silversmiths and an NRHA plaque. 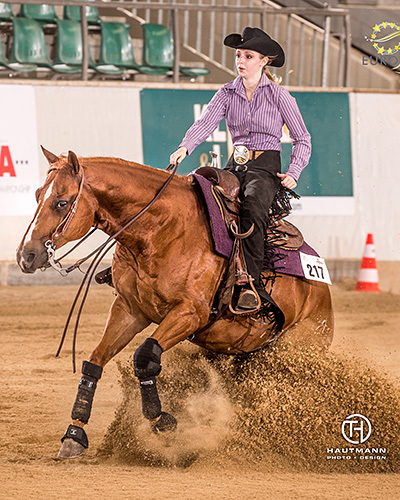 Half-a-point behind, Martina Lissova of the Czech Republic riding her HH Golden Shiner (Mia Shiner x Crona O Lon) and Isabeau Kiser of Sweden aboard Lil Gun Fire (Colonels Lil Gun x LZL Tuff Red Rasberi) shared the third step. They received a pair of stirrups offered by NRHA along with an NRHA plaque. On Thursday, July 26, the NRHA European Intermediate Non Pro, Limited Non Pro and Rookie Professional Affiliate Champions will be crowned in one of the most successful European Affiliate Championships of all time. Winning the NRHA Rookie Level 2 in a field of 42 entries with a 211 was Cornelia Wolf of Austria riding her Arc Mister Playgun (Topgun Whiz x Play Girl Enterprise) owned by Andreas Wolf. “I am thrilled with this win, especially because this horse belongs to my dad and I’ve never shown him before!” said Cornelia. Amber Heidbuchel of Germany placed her Wimps Lil Prize (Wimpys Little Step x Jo Ell Enterprise) second after scoring a 210.5. Taking the first place in the NRHA Rookie Level 1, which counted 35 entries, was Silke Hendrix of Germany riding Twisted Lil Chic (Smart Chic Olena x Chocolate N Sweet). “I am thrilled with this win because this is the very first time that I have had the chance to show in such a big arena,” said Hendrix. 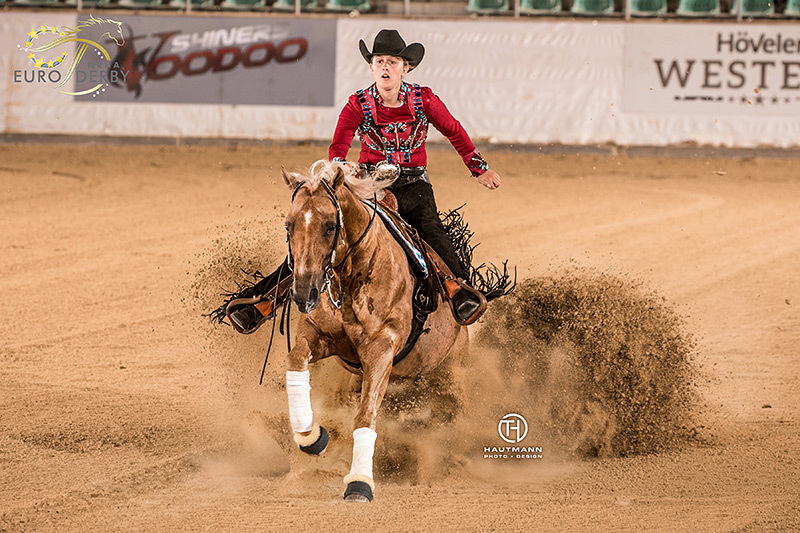 “I’ve had my mare for the past two years and I have to give credit to my trainer, [NRHA Professional] Tiara van Dongen, for coaching me all the way to this win.” The duo scored a 209.5. Second place honors, a point behind, went to Martina Lissova of the Czech Republic and her HH Golden Shiner (Mia Shiner x Crona O Lon). Ancillary action in Kreuth will continue on Thursday, July 26 with the $960-added NRHA Intermediate Non Pro and $480-added Limited Non Pro classes. For Immediate Release – July 23, 2018 – Kreuth – Over 35 countries worldwide watched the National Reining Horse Association (NRHA) European Derby Open qualifier thanks to the live stream offered by MP-Video Westernsport TV. 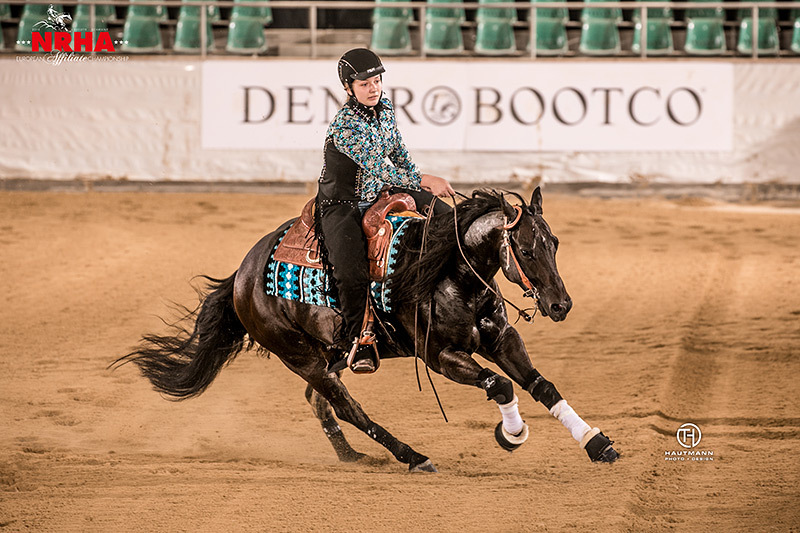 They had the chance to see Shiners Voodoo (Shiners Voodoo Dr x BR China Rose) post the highest score in the $56,665-added* Level (L)4 division with multiple past NRHA Open World Champion Ann Fonck in the saddle. 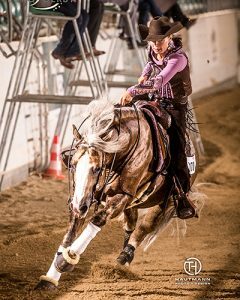 Owned by Kimberly Wegner, the flashy American Quarter Horse stallion was bred by Patricia Blakeney Creson and was nominated by Reto Erdin. 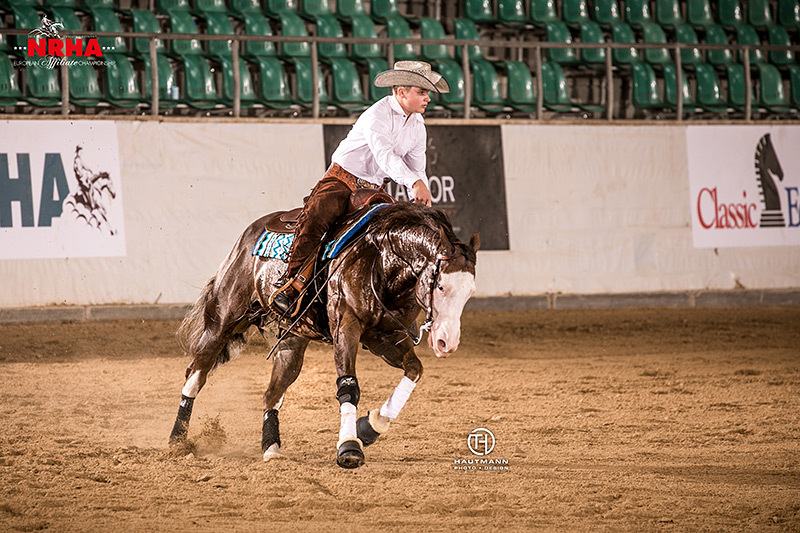 To date, he has won over $46,700 in NRHA competition together with his only rider, Ann Fonck. 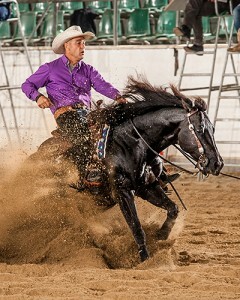 NRHA Professional Massimiliano Ruggeri rode Mister Little Uno (Mister Uno x Bonita Bahia) to a 220.5, the top score in the $40,585-added* L3 Open division. 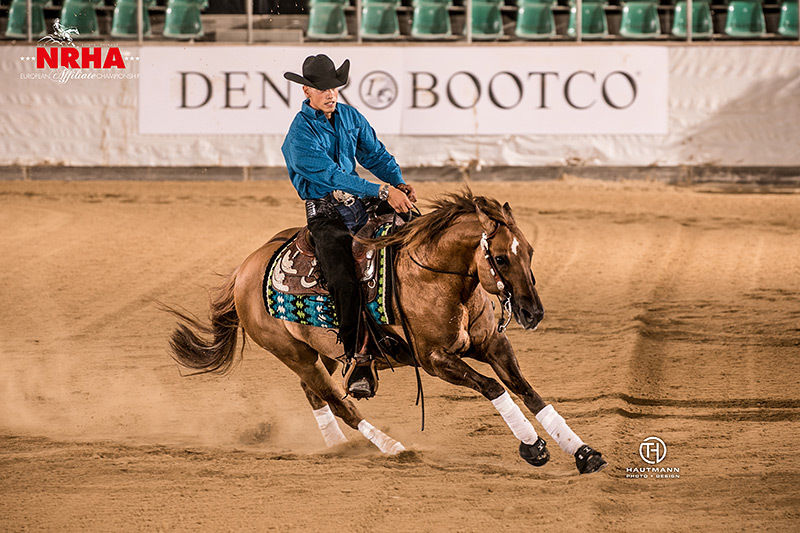 Owned, bred and nominated by Paolo Morandotti, the 8-year-old stallion has over $51,000 NRHA Lifetime Earnings (LTE), all won between the reins of the Italian Professional. 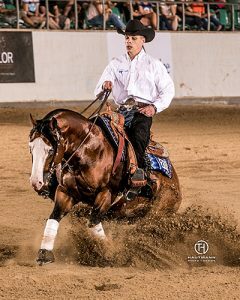 “I broke and trained this great little horse and brought home quite a few titles on him, so making the finals after a great qualifier here fills me with joy,” he said. 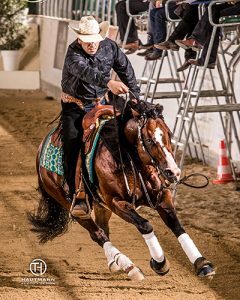 NRHA Professional of Israel Yoav Sugar reined Heidigun (Gunnatrashya x Heidi Sailor), owned by Eyal Carmon, to a 218, tying for the top score of the qualifier in the $23,191-added* L2 Open division. The 5-year-old mare by NRHA Million Dollar Sire Gunnatrashya was bred and nominated by Angelucci Quarter Horses. 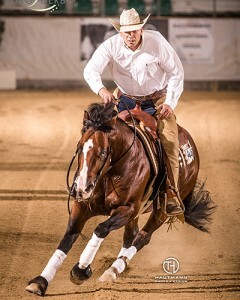 NRHA Professional Markus Morawitz also scored a 218 riding Gunners Chic Magnet, a 7-year-old stallion by NRHA Ten Million Dollar Sire Gunner out of Wind Her Up Chic, owned by Joseph and Tamara Ahorner, bred and nominated by Oldenburg Farm LLC. 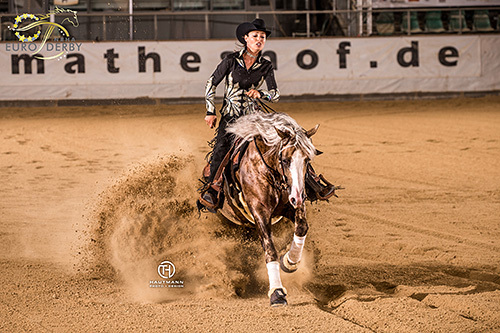 In the $11,595-added* L1 division, two NRHA Professionals scored a 215.5 to lead the qualifier: Petra van Ede riding Whizzin Wimp (Wimpys Little Tejano x Alicias Conquistador), a 5-year-old gelding owned by RS Reining Horses, bred and nominated by Roel van Dijk and Josefin Lintner aboard NRHA Markel Graduate Gunners Western Star, a 6-year-old mare by NRHA Million Dollar Sire Gunnatrashya out of West Coast Princess owned by Anaïs Gasser, bred and nominated by Steve Tyner. Riders that did not make it to the finals will have a chance to make their way to the closing night finals on Saturday, July 28 through the Open Consolation held on Wednesday, July 25. 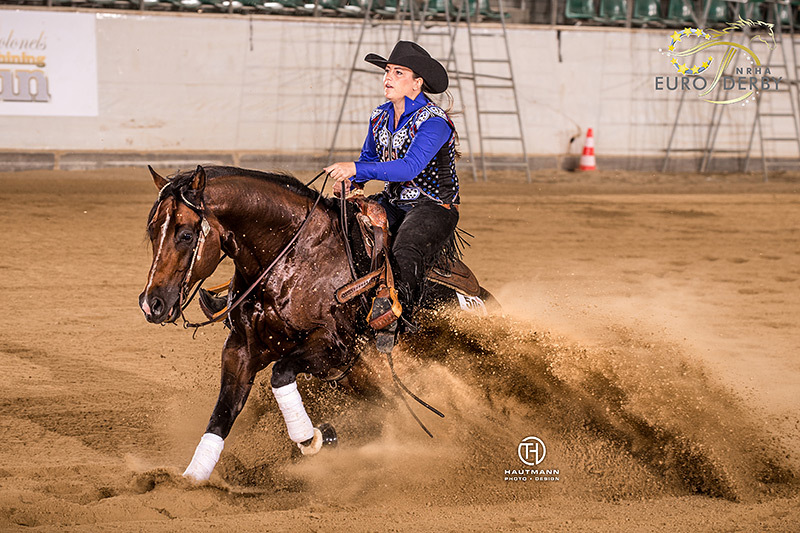 Kreuth, July 23 – Provided by Simona Diale – National Reining Horse Association (NRHA) Open World Champion Ann Fonck and Shiners Voodoo boast, among others, the 2017 NRHA European Level (L)4 Open Futurity Championship. Fourth to enter in the pen in the first go, first section of the $56.665-added* NRHA Level (L)4 European Open Derby, the duo posted a 222.5 score which stayed on top until the last horse-rider-combination of the first section 75 horses later. 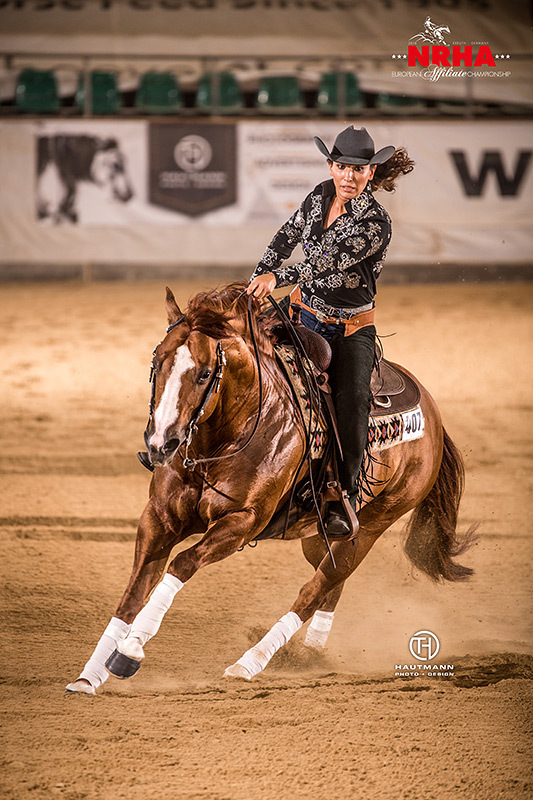 The 5-year-old stallion by Shiners Voodoo Dr out of BR China Rose, owned by Kimberly Wegner, was bred by Patricia Blakeney Creson and was nominated by Reto Erdin. 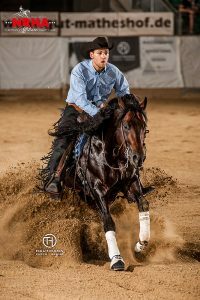 Italian NRHA Professional Lorenzo De Simone rode Azienda Agricola 23 SS’ Smoking Dun It (Gunner x Dun Its Deja vu) to a 220, the highest score in the first section of the $40,585-added* L3 European Open Derby qualifier. The 7-year-old gelding was bred and nominated by McQuay Stables Inc. In the 2017 edition of the NRHA European Derby, the duo took the L2 Open Championship. 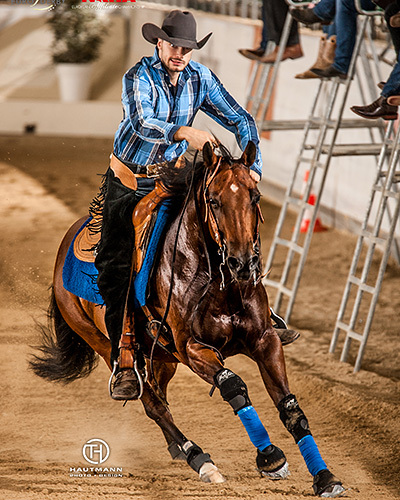 NRHA Professional of Israel Yoav Sugar reined Heidigun (Gunnatrashya x Heidi Sailor), owned by Eyal Carmon, to a 218, tying for the top score of the day in the $23,191-added* L2 division of the first section of the European Open Derby qualifier. The 5-year-old mare by NRHA Million Dollar Sire Gunnatrashya was bred and nominated by Angelucci Quarter Horses. 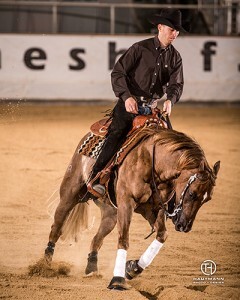 NRHA Professional Markus Morawitz also scored a 218 riding Gunners Chic Magnet, a 7-year-old stallion by NRHA Ten Million Dollar Sire Gunner out of Wind Her Up Chic, owned by Mag. Joseph and Tamara Ahorner and nominated by Oldenburg Farm LLC. 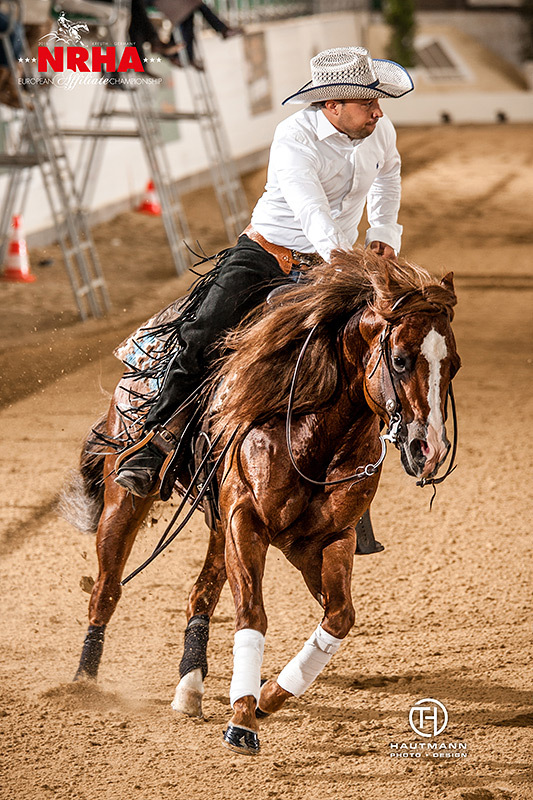 In the $11,595-added* L1 division, two NRHA Professionals scored a 213.5 to lead the first section: Jonas Bujnoch of the Czech Republic riding his own Mercedes Rooster (Cromed Out Mercedes x Rooster Ata Party), a 6-year-old stallion bred and nominated by Werner Filler, and Italian Nico Sicuro aboard Francesco Mazza’s 8-year-old mare Spooks Midnight (Spooks Gotta Gun x Smart Dottie), bred and nominated by his owner. Following the second section of the Open Derby qualifier, which will take place on Tuesday, July 25, the Open Derby finalists will be determined. The following day, those that did not make it to the finals will have a chance to make their way to the closing night finals on Saturday through the Open Consolation. Leading the $4,969-added *L1 division with a 215.5 score is Christian Orth of Germany riding SR Holly Whiza Dream, owned by Stefani Orth, to a 215.5 score. The 6-year-old mare, bred and nominated by Reinhard Orth, is by NRHA Five Million Dollar Sire Magnum Chic Dream out of Holly Dun Conquista. The European Derby Non Pro Consolation will be held on Tuesday, July 24. Riders who did not qualify for the finals will have a chance to earn a ticket to the Friday finals through the Consolation itself. Kreuth, July 22 – Provided by Simona Diale – Close to 480 horses made their way to Kreuth, Germany, where the 2018 NRHA European Derby, open to 5-, 6-, 7- and 8-year-old horses, alongside the NRHA European Affiliate Championship, is being held. Since 2009, foals have been required to nominate to the NRHA Nomination Program to be eligible to enter both the NRHA European Derby and Futurity to win added money created by the program and to earn nominator incentives. There has been overwhelming support of the NRHA Nomination Program since its inception and, in 2017, the program’s eighth year, 1,589 weanlings were European-nominated. The most in the program’s history. 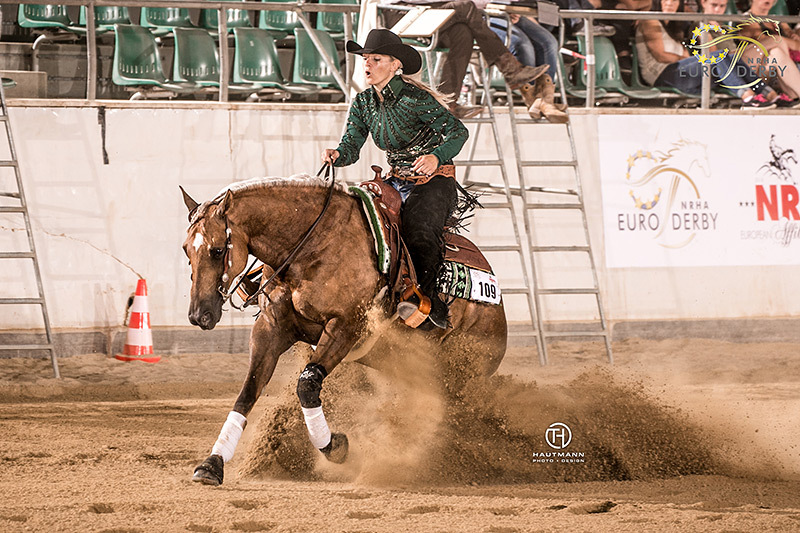 In the first day of competition, the first go, first section of the NRHA European Non Pro Derby was held along with the $11,400-added NRHA European Open Affiliate Championship and $2,250 NRHA Open ancillary class. Taking the lead in the first section of the NRHA European $23,256-added* Level (L)4, $17,393-added* L3 and $9,939-added* L2 Non Pro Derby was Austria’s Ulrike Krueger who posted a 218.5 riding her 6-year-old mare SL Shesgotmesparklin (Jacs Electric Spark x Shes Customized) for the lead. In the $4,969-added * L1 division, Lena Alberti of Germany rode her own 8-year-old gelding Asso Del Cielo (Ricochet Rooster x Jackie Cody Pine) to the lead after scoring a 213. The second day of competition will welcome back non pro riders with the second section of the NRHA European Non Pro Derby qualifier, counting 127 entries, followed by the first section of the NRHA European Open Derby first go, first section.